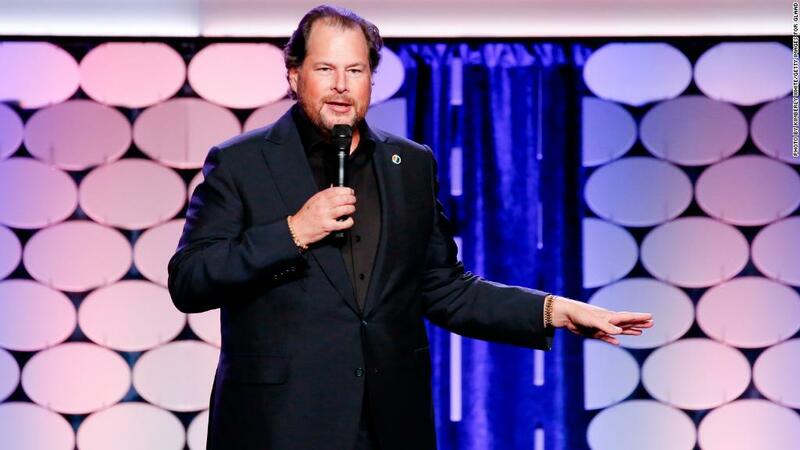 This time it's Salesforce CEO Marc Benioff and his wife Lynne Benioff. They are buying Time Magazine for $190 million from Meredith Corp.
"The Benioffs will hold Time as a family investment," Time editor in chief Edward Felsenthal told his staffers when the deal was announced on Sunday night. "It will have no connection to Salesforce, the software company Marc founded in 1999," Felsenthal said. "While they will not be operators of the business, we are extremely fortunate to have Marc and Lynne's guidance and mentorship as we set out to build a new company." Meredith said the deal is expected to close in the next 30 days. The Wall Street Journal first reported the sale. The Time transaction immediately called to mind Jeff Bezos's purchase of The Washington Post for $250 million. That deal, almost exactly five years ago, was an eye-popping example of a tech guru getting into the journalism business. The Post purchase was separate from Bezos's role as CEO as Amazon. Benioff, who ranks 246th on Bloomberg's billionaire's list, is promising a similar arrangement with Time. "The power of Time has always been in its unique story telling of the people and issues that affect us all and connect us all," Benioff said. "Lynne and I will take on no operational responsibility for Time, and look only to be the stewards of this historic and iconic brand." Despite those reassurances, there will surely be some scrutiny about a Silicon Valley CEO taking over Time, a magazine that frequently covers subjects like technology's impact on society. Felsenthal said in his memo to staffers that the Benioffs have "a confluence of purpose" when it comes to owning Time. "One of the first challenges Marc and Lynne gave us is to think big, really big. Beyond the five-year plan, what will TIME look like in 2040? What will it mean to people decades from now?" Felsenthal said. "That's what we'll all be thinking about as we create a new home for TIME rooted in what we know how to do so well, with the resources we need to reach our greatest potential as individuals and as a team, supported by owners with a sterling record of innovation and of building collaborative, creative cultures." Meredith bought Time magazine and the rest of Time Inc. last November. The company promptly turned around and said it would sell some titles that were not a great fit with its existing titles, including Time. Meredith confirmed the sale plans back in March. It had hoped to strike a deal within a couple of months, but the process took much longer than expected. Through the deal with Benioff, Meredith will still provide "services such as consumer marketing, subscription fulfillment, paper purchasing and printing," according to the company. "Meredith will also be able to include the Time brand in large corporate advertising buys." Meredith is still working on selling three other former Time Inc. titles: Fortune, Money, and Sports Illustrated. Benioff is not buying those. A Meredith spokeswoman said deals for the other three titles are expected to be announced in the "near future."